I crossed the finish line in fairly good spirits. My knee was happy to be done. My body was tired too but not as exhausted as I anticipated. I chatted with my family and training-buddy Mike, and eagerly drank the PBR that my brother had graciously brought for me. I grabbed a few slices of pizza from the athlete food tent, and a 1/2 chocolate chip cookie, and munched on those while Mike and I recounted tales of struggle from the 140.6 miles we just finished. It was still light out. I was really happy to finish my first Ironman in daylight (granted, Coeur d'Alene is way north, and it's close to summer solstice, but still...DAYLIGHT). My family had a bag of post-race clothes for me, and also in there was my phone, which I checked and noticed a post that Mike's wife Sylvia had put up on my facebook wall...I WAS 6TH PLACE F25-29!!! Holy crap! I shrieked in the middle of the street. It was an amazing feeling. Coming into the race, I only knew one other F25-29er (Alyssa) and knew that she was a speedypants, but I had no idea who else was showing up. So I was pretty stoked to learn that I landed in the top 10, and even more so - only 30 seconds out of 5th place in the AG. On a tough day, on a tough course. Solid. Time for pizza and beer with Mike! We went to gather our gear bags from transition and on the way a few people commented on my beer. One guy said it looked delicious so I shared with him. Later on, another guy made the same comment so I decided to share again, except he took my almost-empty can and DRANK THE WHOLE THING. I was completely taken aback by his rudeness! A mountain biker would never do that, right??! At least they would have asked? Emerging from the post-race bonk. This is about 1.30am. The rest of my night and most of Monday was spent feeling pretty miserable. My knee hurt, but my stomach hurt more. I was a wreck internally. I never threw up, but instead of cheering on the bleachers for the midnight finishers, I was curled up on the sidewalk with my head in my mom's lap, wrapped in Mylar blankets. THANK GOODNESS FOR MOMS!!! Also thank goodness for coaches, Sonja found me in my vegetative state on the streets of CdA and immediately prescribed Pedialyte, Seven-Up, Saltines, bagels, etc. I was bonking and I didn't even know it. So, what's next for me? Well it's definitely not triathlon. A few people seemed to think that a Kona roll-down would come my way and frankly I was not expecting it and I'm glad it didn't happen (good luck, Kayla!). Like I mentioned in my playlist post, I'm super excited to get back to the off-road side of things. I'm racing (and drinking carbonated hop-flavored water) in Thursday night Dirt Crits. 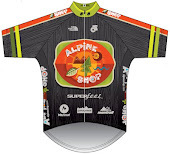 I'm racing as a guest on gearjunkie.com's AR team in the upcoming MNOC Adventure-O on July 14th. I'm actively looking for teams to race with at Thunder Rolls 24hr AR, Berryman 24hr AR, and USARA/Checkpoint Tracker Nationals in the fall. There's a certain mountain bike race on my radar. I'm even considering a go at Orienteering Nationals in October. Where does triathlon fit in this picture? I'll let me heart tell me when it's right, but I'm guessing it won't be until at least November or December. I can't say enough how much my family, friends, and coach helped me prepare to execute this race. My parents have perfected long-distance parenting from Minnesota (example: knowing not to call me past 9pm because I'll be sleeping anyway) and supported me through training from afar, and then showed up at the race ready to help me and any other athlete that needed it. My brother came along too; he drove cars, ran errands, schlepped bikes, carried bags, and just generally was so helpful!! My whole family volunteered at Run Aid Station #1 and it was so great to see them out on course...love you!! Thanks to everyone from St. Louis who made the trip to compete or spectate, it was so wonderful seeing familiar faces, on the run course especially. Made it feel like a hometown race! And finally thanks to my coach Sonja, who prepared me perfectly to throw down a solid first Ironman, and from whom I have learned more about endurance training than I ever thought possible. A word about "the tattoo". 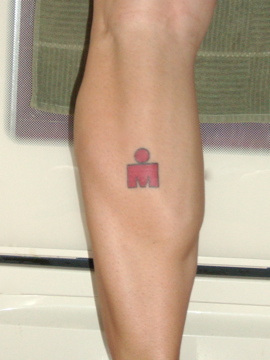 For you non-triathletes out there, it's common for Ironman finishers to get a tattoo of the M-Dot when they finish a full-ironman distance race. I love tattoos. I have one. I want another one. But I do not want a corporate, for-profit logo inked into my skin. To me, it's like getting a tattoo of the Coca-Cola logo when you finish a 2L bottle. Not happening here. A word about Coeur d'Alene - the town is great, it reminds me of Duluth. And you know I love Duluth. The volunteers certainly lived up to their lofty billing. My favorite part of the run course was "happy corner", which is somewhere I think on Lost Ave, anyway it's in town and the homeowners had this huge party going, speakers, music, people, wow. It was awesome, and gave me a huge boost each time I ran through (four times). A present from my Mom! yay! are you racing with virtus? We have two teams going to USARA nationals and the second team is looking for a strong woman. Want me to connect you over email? Okay - I'll send a note connecting you and Bruce later today. They're still waiting to hear back from one person, but can't hurt to start the conversation in the meantime!